Loving the stuff on my blog and podcast and wish you could take this kind of stuff further? My online courses may be just what you’re looking for! Procrastination-Buster Bootcamp is my beginner course on productivity. You can check it out for free as an email course (each lesson delivered daily via email) or you can opt to buy full, instant access to all lessons for only $10 USD. When you’re ready to take what you’ve learned further and really dive into productivity mastery, Productivity Ninja is my next-level course for giving you the tools and strategies you need to achieve your goals. Don’t want to wait for each lesson to show up individually? You can buy instant access to all modules for only $10 USD, if you prefer. Ready to go further with what you learned in Procrastination-Buster Bootcamp? 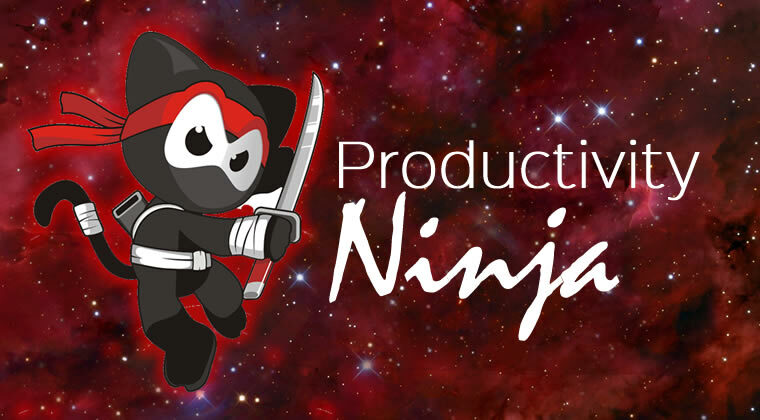 Sign up for Productivity Ninja and get next-level systems and strategies for turning your could-be’s into realities! Want to learn more before buying? You can get all the details about this course on my Thinkific course page.